I LOVE the 4th of July. Just like Thanksgiving everyone is invited to the party regardless of religion. 1976 Bicentennial year- that was the grand poo- bah of all 4th of July’s . I was in elementary school. Busy learning fractions and state capitols. After school I would play paper- dolls with my best friend. Jennifer Nevins- (same first name we called each other tweens). While playing paper dolls we would listen to the eight track of Casey Kasem’s American Top 40 and sing along at the top of out lungs. Baby you’re not that kind…. These were the best of times. My home town of Salina, Kansas prepared for months for this red,white and blue letter day- The BICENTENNIAL. Every single fire hydrant in Salina was painted to celebrate. Some were painted with stars and stripes, or a squat hydrant George Washington. 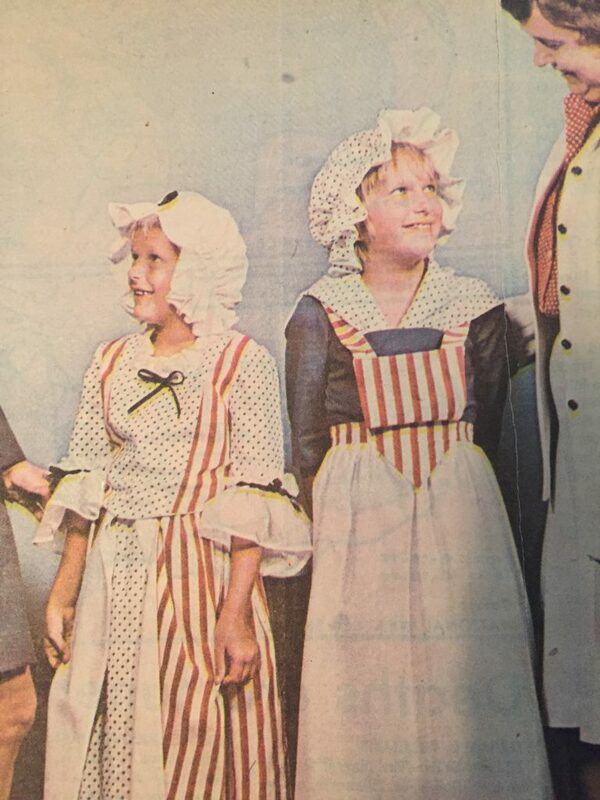 My mom sewed me a Betsy Ross coustume and made me wear it the Women’s Guild Fashion show, or was it the Shriners’ pancake feed- nonetheless the image of my coustume was saved for posterity and on Sunday my photo in this hideous star-and stripe nightmare was in The Salina Journal bonnet and all. There were block partie’s planned all around town. 4th of July 1976 is a day I will never forget. My sister and I woke up early and decorated my dad’s Chevy Impala convertible with red , white and blue crepe paper and balloons. 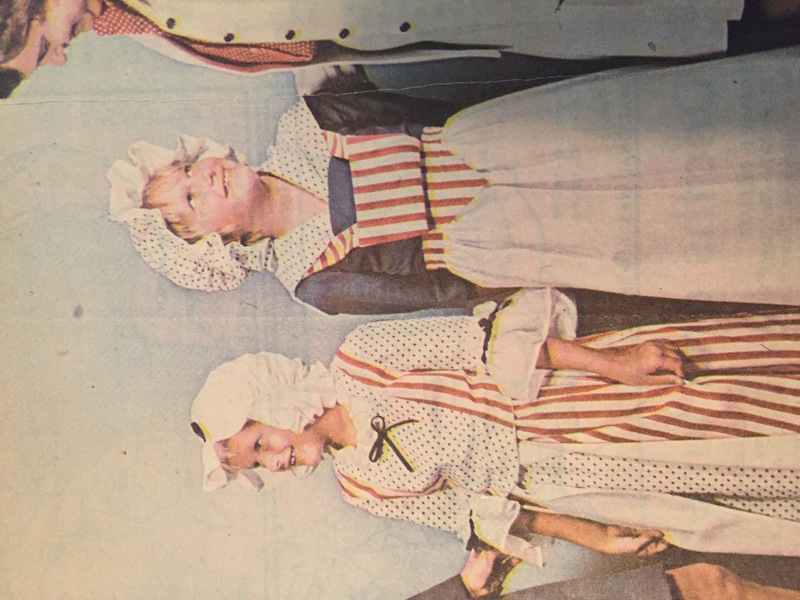 We sat on the back seat in our Betsy Ross and Martha Washington coustumes waving at all the folks that lined South Sante Fe Street for the 4th of July parade. After the parade we went to our home on Tenth Street where for the last 36 hours friends of my parents had been keeping careful over a hog named Fred that was on a spit and being smoked and about to served at my parents Pig-nic. There was lots of food in addition to Fred, Dr.Pepper for the kids, Pabst Blue Ribbon in a keg for the adults, and water ballet in the swimming pool. Later that night my favorite thing of all about the 4th ……fireworks! Fireworks were readily available in Kansas in 70’s my brothers used to set off bottle rockets near my sister and I for a laugh, and there was always some kid when school started again that was missing large chunks of skin because of a firecracker mishap. We loaded up the green station wagon with picnic blankets and headed to the old military base to watch the municipal fireworks. I didn’t care that I was being chewed up by mosquitos and fire ants or that my skin was the color of a watermelon since it never occurred to my mom to put sun screen on us. I was so happy celebrating America’s bicentennial and calculated in my head how old I would be on America’s 300th birthday. I still love the 4th and we often host a party at our house to celebrate. I usually put up the flag up on the front porch on Memorial Day and it usually doesn’t come down until Veterans Day in November. This year I didn’t put up the flag on Memorial Day, or Flag Day and when I started to put up the flag for the 4th of July I stopped.